Its the summer season and the season of Mangoes. Let me give you an easy but tasty Kerala style instant mango pickle (Manga achar) recipe. Peel the skin of mangoes and cut them into small pieces. In a bowl mix the sliced mangoes, salt and keep it overnight. On the next day, add garlic and green chillies to it. In a pan add coconut oil, splutter the mustard seeds and curry leaves. Add ginger to the pan and saute them till raw smell goes and reduce the flame to low. Then add Red Chilly powder, Turmeric powder, Fenugreek powder, Asafoetida powder saute for 2 minutes (don’t overheat). Add little water to form a thick paste. Add the ingredients in the bowl to the pan and and turn off the flame. Mix well and transfer it to a jar and better start serving after three days. Can be served with rice or kanji. Use only clean dry spoon to take the pickle. It will prevent fungal growth in the jar. Tightly close the lid after each use. Don’t use steel jar for storing ,because there will be reaction between the salt and the steel. If you are using pickle powder, after the step 4, add pickle powder, warm it and saute. Skip to step 8 and continue. Do you need more mango recipes? 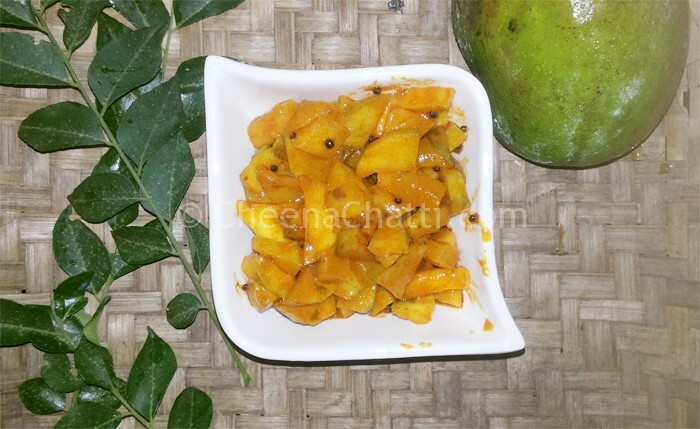 This entry was added on May 26th, 2013 by Renoos in Condiments and tagged with kerala pickle recipes, sweet mango pickle, kerala mango pickle, mango, pickles, how to make manga achar, mango pickle recipe, simple manga achar mango pickle, nadan manga achar. Last revised on April 4th, 2018. Quick & easy one – loved it.